Gee, has it really been over 12 years since the first time I saw Luke Skywalker put a proton torpedo up the Death Star's shaft? Star Wars' climactic attack on the planet-smashing battlestation is one of those sequences on film that is not soon forgotten. The dizzying run down the Death Star trench, while simpler as a visual effect than many of those seen in later Star Wars films, was extremely effective. How many of us wished we could pilot an X-wing fighter down and blast that battlestation to smithereens? 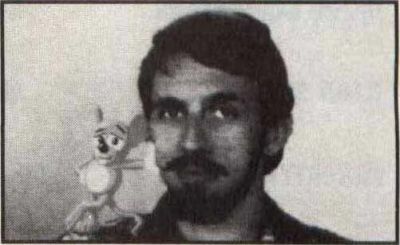 In the early 80s, Atari Inc. released a coin-op arcade game that let you do just that: play Luke Skywalker in the final assault on the Death Star. The game featured the Star Wars theme music and digitized bits of dialogue from the film in addition to nice graphics and gameplay. It was a big hit. 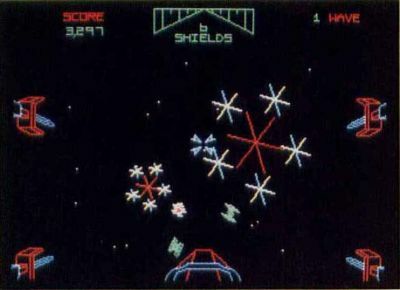 The game used color vector graphics to simulate a first-person perspective view from an X-wing fighter. On-screen, you could see the nose of your fighter and the laser cannons extending from your wingtips (out of view). To operate the fighter, you gripped a massive controller that turned from side to side like a steering wheel and had twin pilot handles you could pitch back and forth. This provided turning control as well as climbing and diving capability. On the controller were four triggers, all of which fired your lasers. If you used the thumb and index finger of both hands and rapidly pumped all these buttons, you could get all four of your X-wings’ lasers to blaze like mad. You only had one life, but your ship was equipped with shields, each of which could sustain one hit or collision. When all your shields were gone, one hit sent you to join Obi Wan Kenobi. The game had different difficulty levels, but a typical "wave" went as follows. First you were flying in space above the Death Star, blasting TIE fighters and at the same time detonating the "fireball" shots they fired back at you. The TIE fighters swarmed like gnats and were difficult to hit on the higher levels. Darth Vader's custom TIE ship would cruise through, and while you couldn't destroy it, every time you hit his ship you got a hefty pile of points. Once the TIE fighters had given up (or you vanquished all of them), your fighter plunged to the Death Star, where you would fly low over the surface, destroying laser bunkers and blasting the laser-firing caps on the battlestation's towers. If you could blast the tops off all the towers, you got a 50,000-point bonus. Worth it, but tricky to do. Of course, both the bunkers and towers shot fireballs at you, so you had to deal with them while trying to navigate between the towers! The final part of the wave was the actual run down the Death Star trench. 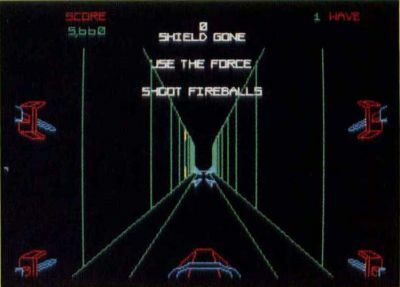 While the arcade game luckily didn't include Vader and his goons chasing you down this metal-walled canyon, it complicated the maneuver by forcing you to deal with fireballs fired from gun emplacements in the trench and threw in catwalks and wall segments for you to maneuver around. You might have to shoot a fireball while "porpoising" over and under catwalks and zigzagging among walls. At the end of the trench was the thermal exhaust port. You knew when it was coming up because you'd hear Han Solo's voice yell, "Yahoo! You're all clear, kid!" If you missed it with your lasers, you hit the end of the trench, lost one shield and had to try the same trench all over again. If your shots hit the port, your fighter would race away from the Death Star, which would explode in a pretty display of vector-fireworks. Han's voice would congratulate you, you would gain one shield and then it would start all over again...but harder. Now Broderbund has released for the ST the Domark Ltd. conversion of this arcade classic. The game is incredibly faithful to the coin-op original, from the title, level-select and high-score screens through the look of the game and the gameplay itself. The digitized dialogue is there, as are the TIE fighters, fireballs, towers, bunkers, catwalks and other imperial dangers. The graphics are rendered with lines only, giving the same feel as the vector graphics of the arcade game. Aside from the good digitized voices, the game's sound effects are okay, but not great. The weakest sound of all is the destruction of the Death Star. It sounds too blinky-clinky, not at all like a big explosion. I've heard the ST sound chip do better. There are a few minor differences between the arcade and ST versions: The laser cannons in the trench are flat squares on the walls and do not stick out like those in the arcade. Therefore, they are much harder to hit. I also noticed a complete lack of the coin-op's trench wall panels, which could be blasted for extra points. The TIE fighters are much easier to deal with too, as they don't seem to move about quite as zanily as their arcade counterparts. The strategy required, however, is much the same as in the arcade. You have to concentrate on not letting the fireballs hit you. Fortunately, you can often steer out of their way, but you have to make sure that in so evading them you don't crash into a tower or catwalk. I found that if you have any trouble with the TIE fighters’ shots hitting your shields, just hold the cursor at screen center and fire continuously; no fireball will hit your ship. This is because the fire-balls always cross the center of the screen when they are about to strike your ship. This only works well with the TIEs, and you mustn't be maneuvering a lot. Down in the trench, you find that the fireballs stay at one level and to one side or the other of the trench, so it's simple to avoid them... if you don't sweat the catwalks. It's easy to miss the exhaust port, so the moment you hear Han's "Yahoo!" you should be firing like mad at it. Don't sweat any fireballs fired by guns around the port. When you hit the port, all such shots are rendered harmless. For extra points, pound your shots into Darth's ship whenever possible, and particularly when he retreats toward the Death Star at the end of the TIE combat mode. You'll get 2,000 points for each hit. High scores are entered with the game controller, arcade style, by "zapping" letters. The top score is saved to disk; all others are not. There doesn't seem to be a key that brings up the high-score table. Also, while the instructions don't mention it, the F10 key brings up the game's version number. I was unable to find a way to restart a game in the middle. To start over, you must first die. This game is pretty good, but it has an Achilles heel: the controls. Control can be either by mouse or joystick, but neither is anything like the big controller used in the arcades. You can set either one to "airplane" controls, where pushing the stick/mouse forward causes the ship to dive and pulling back makes it climb, or to "normal", where pushing forward makes your ship go up and pulling back makes it go down. All fine and good, but there are problems. The mouse is responsive enough, but it's easy to move it too quickly and have it skip. I once jammed it forward to dive, moved it too fast and my ship only nosed down a hair; I plowed through three catwalks and boom!...game over. The joystick is so bad that I hate to mention it in an otherwise positive review. It's so overresponsive that I, who will usually take a stick over a mouse any day, refuse to even allow a joystick to be in the same room as my ST when I'm playing this game. The version of this game that Domark Ltd. markets in Europe suffers from these same control deficiencies. It's too bad Broderbund didn't have the joystick control fixed up before they released it here. The instructions are on a foldout sheet, like a poster. The directions are simple, showing you how to boot the game and use the options keys and controls, and also describing each portion of the attack in enough detail to get you going. This sheet includes directions for the C-64, ST and Amiga. You are instructed to boot the game from Drive A (it autoloads), but I found I could run it from the Desktop (I ran STARWARS.PRG from the Auto folder) as well. The disk is copy-protected. I have to mention the packaging. The box is very nice, featuring an excellent cover painting by Ralph McQuarrie, who executed the now-famous preproduction/conceptual paintings for Star Wars. The back of the box features a photo from the trench sequence of the film as well as some game-screen shots. The point of interest is the little red "button" on the back of the box. Above it is a label that says: "To relive the Star Wars experience, use a little Force here." And what happens, you ask? The box plays a portion of the Star Wars theme! When UPS delivered the game to me, I heard the package before I even saw it. I told the delivery lady that I guessed it was a moot point to ask if the package was from Broderbund. Star Wars is a good game. Perhaps it's a little dated now compared with the latest and greatest arcade hits and ST games, like Starglider II, but it's still fun to play. If you liked the arcade game, enjoy blasting spacecraft or just want to use a little "Force," buy it.